Have you ever found that perfect thing? That one elusive piece that’s going to totally change a room and complete your life? As in “Oh Pottery Barn bedding, you complete me!” No? and then sometimes that something comes in the mail and you giddily assault your UPS driver as he’s coming up the sidewalk and rip the box from his hands….just me again? Really people, it’s the little things in life! So you get the box upstairs, unpack the bedding, get it all set up and…. maybe we weren’t meant to be? No,wait! 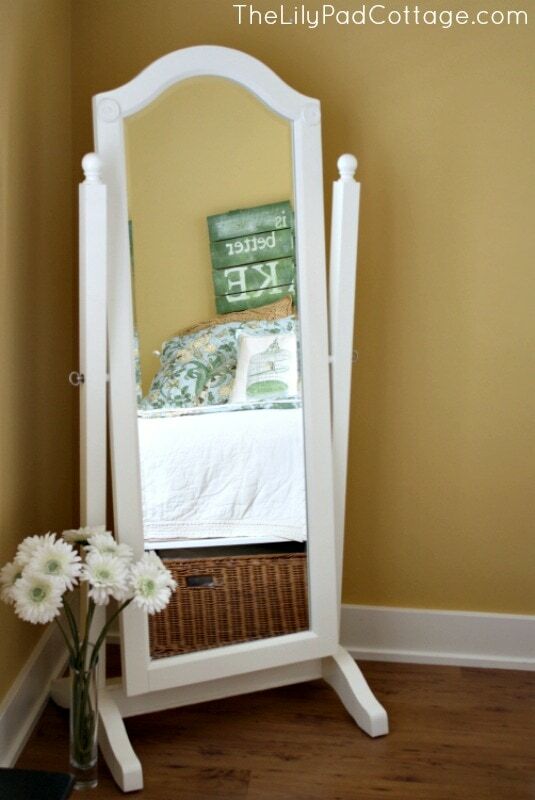 This was supposed to magically transform my master bedroom to the space I always wanted! I’m keeping it darn it! It will grow on me, I just need to get used to it right???? That’s when you call your amazing mother (who is used to your hair brained ideas, cuz you know she’s your mom and has had to deal with you for the last 30 years) and convince her, her guest room NEEDS a makeover! And wouldn’t you know? I have the perfect bedding you could use, and I’ll sell it to you, and even give you a break on shipping and hand deliver it and make the bed, and help you decorate the room and and and…you get the picture – how could she say no? AND you know what? It looks perfect in here, just like I planned all along (ahem). Did I mention the Mr. and I actually lived in this room for 9 months? My parents graciously allowed us to stay with them when we first moved back to this side of the state. I think they were thinking it was going to be a month or two while we found a house …and then we decided to build this one. 9 months later we all breathed a sigh of relief when we finally moved out. It looked nothing like this when we stayed here, you couldn’t see any part of the floor and it always looked like a bomb had just gone off in the tiny closet. We went from a 5 bedroom, 4 bath house to their 2 guest rooms. Our daughter (who was 2 at the time) and her toys pretty much took up all of the one room so it was a little cramped. I’m sure it drove my parents nuts, you could hardly walk in the room, it drove me nuts too! I’ll be sharing more of my mom’s house next week. My parents master bedroom, bathroom, sitting room is about to get a complete overhaul which has been so fun to help my mom plan. The Mr. loves it too, since it means I haven’t had as much time to rearrange our house! I’ll be sharing the before pics and keep you all posted along the way. Moral of the story? Go with your gut, if it’s not love at first sight – return it….or have a fantastic mom like me! and a peek of her gorgeous music room here. I agree. If you have any question, they you will probably end up wishing you hadn’t bought it. You are lucky your mom would take it off your hands. That is so cool! My mum and I swap all the time – our tastes are fairly similar; sometimes she’ll buy something but it looks better at my place and vice versa, or we get sick of something after a few years and swap things! That bedding is gorgeous – beautiful colours, and looks fabulous in that bedroom. Well done! Oh I so love PB! The bedding is gorgeous! The wall color is perfect! 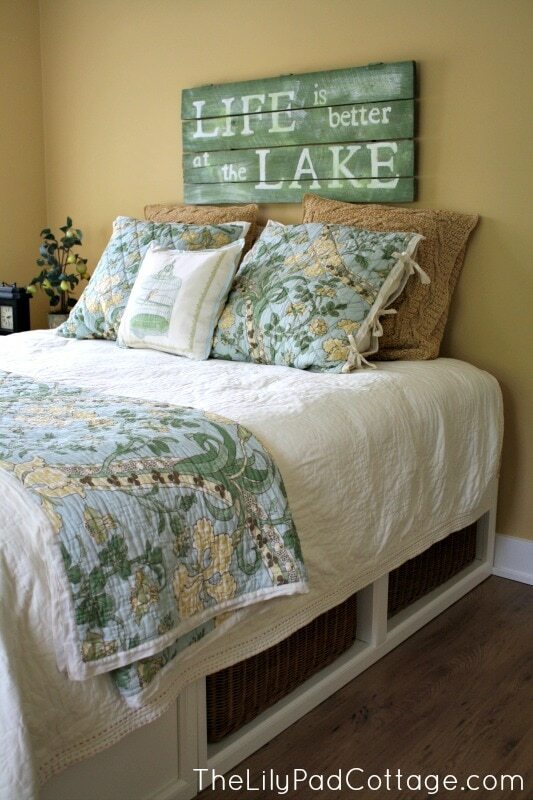 I have that same paint in one of my guest rooms. Love Love Love it! My daughter and I decorate together all the time. It’s so much fun! Beautiful room. The floors are perfect. Do you have any detail on the hardwoods in your mom’s house? The room looks great. Beautiful colors. 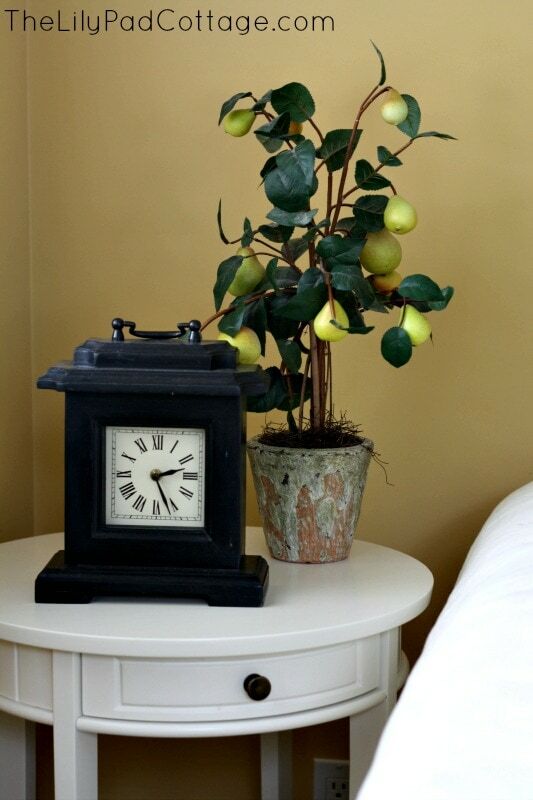 I love the little pear tree and the baskets under the bed too. My daughter and I love to decorate together. I’m working on refinishing a dining table for her. She’s on a tight budget because she is a grad student so we love looking for bargains and are not to proud to rescue somebody else’s “junk” and repurpose it in her home. It’s just fun to share and work together making a home more welcoming. I too, sometimes wait for the UPS man. One winter we had a huge snow storm. No one came down our road that entire day, not even a snow plow, when late in the afternoon I thought I heard a truck. Sure enough the UPS guy was stopped at the end of our drive along the road and jumped out in waist high snow drifts to deliver a package! He had a huge smile on his face and I thanked him. I told him that was dedication. I just love what you did with this room. 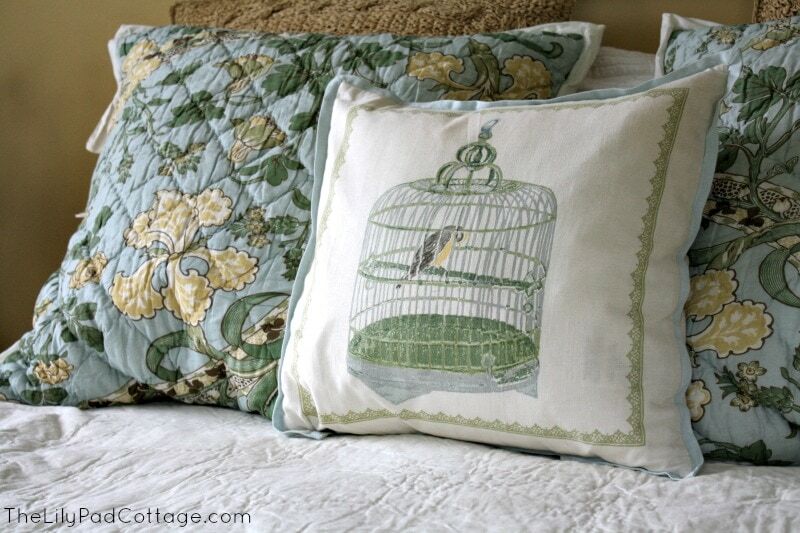 So very pretty with the colors and that bedding is so pretty! 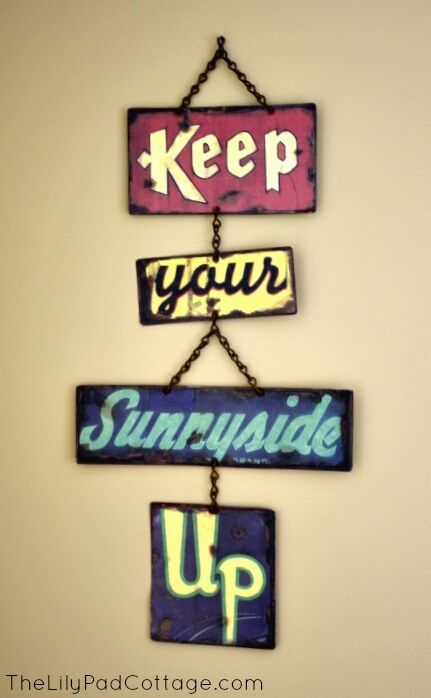 Love the sign over the bed too. Your daughter is priceless, can we go back? Then to find out you only live 15 houses away, just too cute!!! I do LOVE that your family is so very closer in the love you have for one another and wanting to be together! 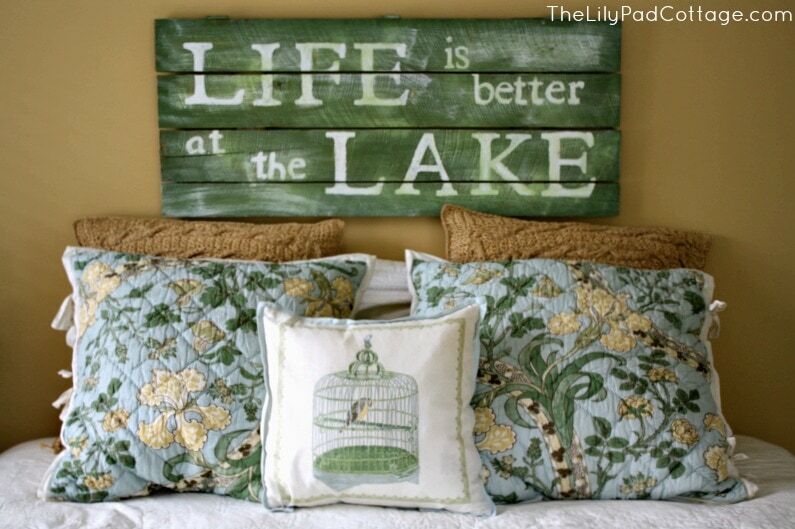 What a lovely room, and I love the signs, and yes life is better at the lake. Just beautiful! How great that you could share with your mom. The room turned out beautiful! Is that a PB bed, by the way? Good eye Megin! It IS a PB bed LOL! Girl you’re too funny. And yes, this has happened to me. My UPS man is used to me assaulting him. 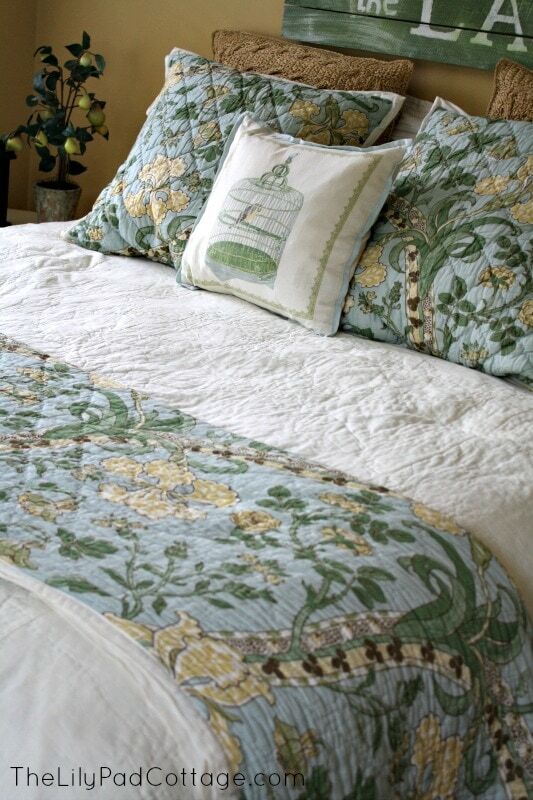 The PB bedding looks awesome in your Mom’s house. She’s lucky to have you! Really beautiful! 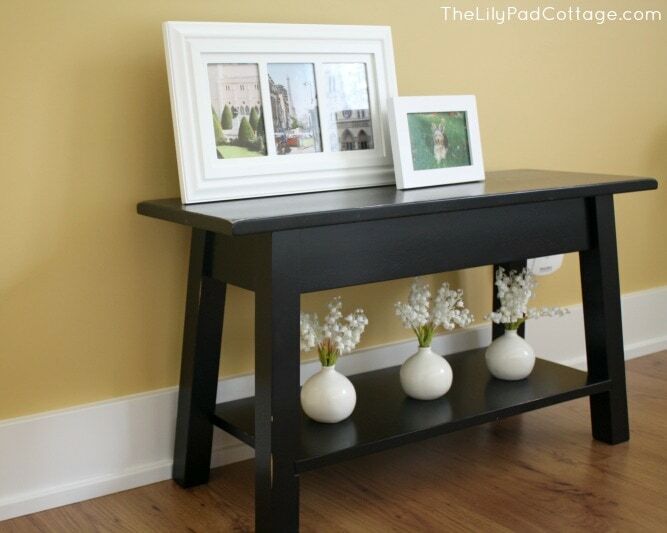 Question— Do you happen to know the color of the paint in your mom’s “Music Room” post? Its kinda perfect! Thanks Jennie! I don’t know the color of the music room but I do know this it is on the same color card as the Golden Straw by benjamin moore that is in the guest room. I think it is the shade that is just lighter, if that makes sense? Kelly and Pam, clearly nothing is the same as last time we were there. SOMEHOW, we have to get back there to see the decor, but mostly to see our friends!! I’ll pass that on to my mom Gina, it would be great to see you guys again! What is the name of the bedding? I don’t think they carry it anymore Jessica, sorry! love the bedroom! I particularly like the sign over the bed. Do you know where she found it. 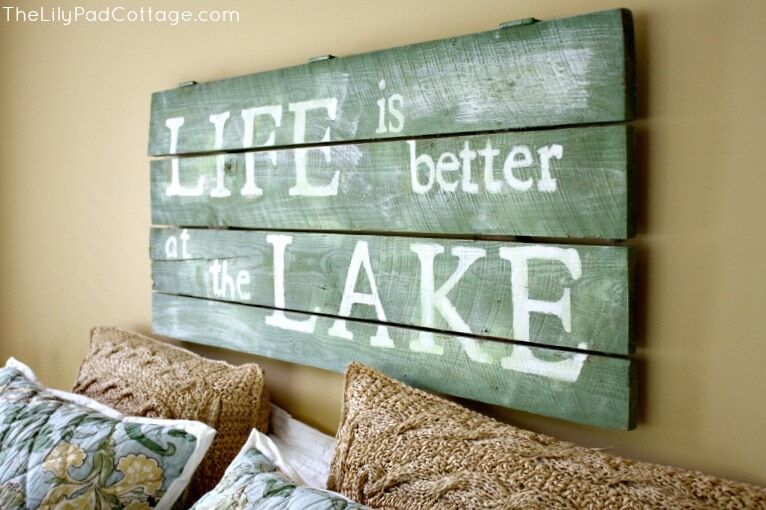 It would look great in my lake front home! Thanks Rebecca, a local artist painted it, sorry! What was the name of the bedding? I love it! Oh man this is an old post I don’t remember sorry!